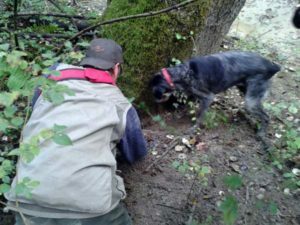 “Guarda che cosa ha trovato!”, Alfonso suddenly exclaimed and he showed us a small black truffle his dog Lilla was supposed to have found. (“Look at what she has found!”) It was all a bit strange, however. Earlier, when Lilla seemed to be on to something, Alfonso made sure he was with his dog as fast as he could (struggling and stumbling through bushes and over branches) to keep Lilla from eating the delicacy. This time, not only had Lilla not attempted to eat the truffle, but she brought it straight back to her boss. Didn’t she like the black ones? Or was Alfonso pulling our leg, as he did with all the other tartufai that we encountered along the way. When these competitors asked him whether he had already found anything that day, he would show them the white gems he brought along himself. A burlone (prankster), that’s what he was, this Alfonso. Our guests were very interested in the truffle experience. 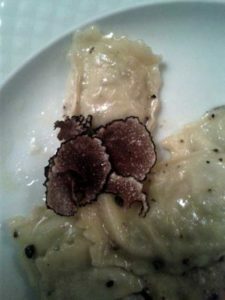 This being the season, we ate the evening before at the excellent La Verde Sosta restaurant, where owners Grazia and Pino presented a special menu with truffle ravioli and other delicacies. We had our first good culinary truffle experience in the Oltrepò as well, at the sublime Bagarellum restaurant in our village. Previous attempts in Umbria and Piedmont(!) were disappointing: no scent, a taste of paper. And very expensive. But the risotto al tartufo of Leda of Bagarellum did not cost any cent extra and was fantastic. So, THIS is what all the fuss is about we thought. NOW we understand! The scent was mouthwatering, the taste unforgettable. There are many different kinds of truffles, white and black ones, some grow all year others only in autumn, the wet season. They are found near the trunk for trees like the acorn, not only in the famous regions of Umbria and Piedmont but also in ours, the Oltrepò. As these culinary gems are worth quite a bit of money, people have tried to cultivate them, without much success. It is difficult to create the right circumstances for the truffles to thrive, apparently. Which should not come as a surprise, as they are difficult to find in nature as well. Our little hunting adventure learned us such at least. 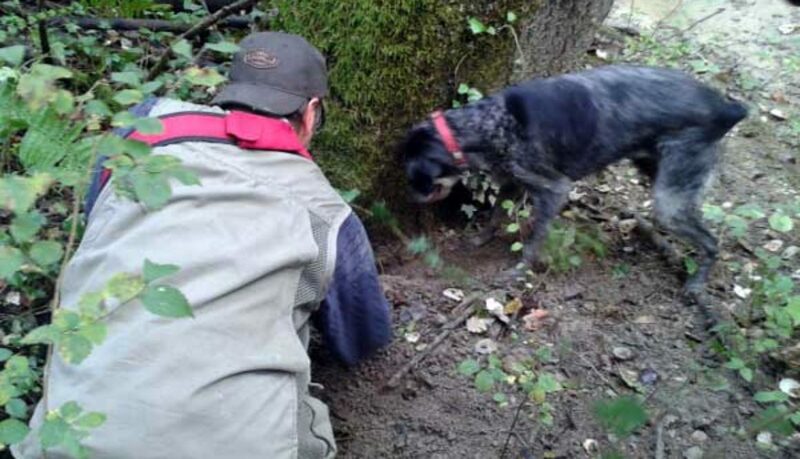 As I happened to have met truffle hunter Alfonso recently, I had arranged an excursion for our truffle loving guests. We walked in the woods along a small stream, still muddy after the rainfall of two days before and Lilla, the trained dog, started sniffing around. Alfonso told us he bought the dog, already fully trained, at a price of $3000. It would take quite a few finds to regain this investment, but afterwards Alfonso showed us a picture of himself with a monster sized white truffle that earned him $5000! Truffles are found along the roots of poplars, roots that can reach several meters in length. In the end we only found one tiny white truffle. And that black one? …it wasn’t even muddy when Alfonso handed it over to us. 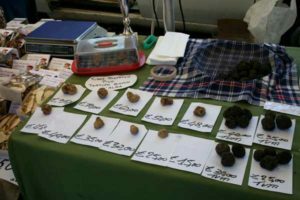 Next time maybe we need to return to the big truffle market at San Sebastiano al Curone that we visited a few years ago. There hundreds of hunters expose the treasures they found, from the small to the extremely big. Truffles everywhere!